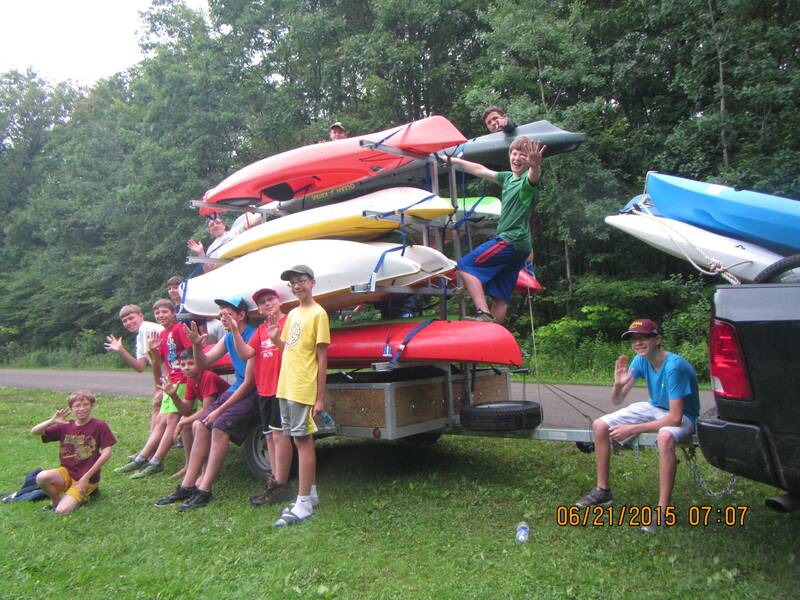 Pictured above is Boy Scout Troop 57 out of North East, PA with their new 8 Place Kayak trailer that we shipped to them from Minnesota. The Scout Master John, says he can get 10-12 kayaks on our 8 Place Kayak trailer without any problems. In the photo the Boy Scouts utilize our tie down loops on each crossbar to ensure their kayaks are strapped down and wont move during transport. This Boy Scout Troop Kayak Trailer was bought with the black water proof canvas cover (not pictured), but you can view the canvas cover on our 8 Place Kayak Trailer page. The Scout Master, John, chose to upgrade to LED lights to increase the visibility of the lights. LEDs are much brighter!!! The 6ft tongue with 7ft long trailer box, this trailer can hold up to an 18ft kayak or canoe.